The anthropogenic extinction of bears, moose, aurochs, beavers, wolves, lynx, bustards and everything else bigger than a house brick means that Britain has no ‘charismatic megafauna’ (domestics and recent introductions notwithstanding). But given that all tetrapods are inherently fascinating, our fauna still has a lot going for it, and we still have a lot of neat beasts. It’s near the top of the list – it’s the Slow-worm Anguis fragilis, a limb-less anguid also known as the Blind-worm or Ovet (apparently). It occurs throughout Europe (except for southern Portugal and Spain, Corsica and Sardinia, Ireland*, and much of Scandinavia) and is also found in Asia as far east as the Caucasus, and in parts of Algeria and Tunisia. * Although there are some indications that the species might actually be present on Ireland. See McCarthy (1977). In my experience lay people find it utterly inconceivable that it’s not a snake, and most think that it’s a ‘grass snake’ (the true Grass snake Natrix natrix is an amphibious colubrid that’s normally between 60-100 cm long). Slow-worms are nocturnal and semi-fossorial and mostly occur in well-vegetated places with thick ground cover and loose soils. They hide under large stones, pieces of wood, sheet metal and other debris. Of course places that fulfill these criteria are exactly those places that are nowadays covered by concrete or turned into housing estates, and today there are less gardens and allotments that are suitable for slow-worms than there used to be. They also suffer heavily from predation by domestic cats: over a five month period of a single year, Britain’s 9 million cats are estimated to bring home about 5 million non-avian reptiles and lissamphibians, and of these about 12% are slow-worms (Woods et al. 2003). That amounts to about 600,000 slow-worms killed over five months, every year (if I’ve screwed up the maths, which is likely, let me know), which might be a non-sustainable number if we actually knew what the total population is (and we don’t). Certainly my parent’s cats reportedly kill or mortally wound enough slow-worms to create the impression that all the large juveniles and adults in the area are being extirpated, and slow-worms are certainly less common here in Hampshire now than they were when I was a boy. Despite this however, I’m pleased to say that even today it’s not difficult to find them in suitable places if you know where to look, and lately Will and I have discovered them whenever we’ve searched in the right kind of habitat. On a well-vegetated piece of waste-ground about 200 m from my front garden there is a piece of carpet where there’s an ant’s nest, and it’s under this piece of carpet that we’ve been finding slow-worms. Last week I was lucky enough to discover three, all hiding there together, and they’re the individuals featured in the photos here. Slow-worms are viviparous, giving birth to 5-12 babies (though exceptionally as many as 26) during August or September. The juveniles, normally around 10 cm long, have a gold dorsum with a black central dorsal stripe and black sides. In adults, it’s easy to distinguish males from females. Females tend to have a proportionally smaller head and more distinct neck, and also a more demarcated tail, but more obviously they have a dark stripe down the centre of the back and dark sides. The dorsal stripe is usually straight but in some individuals it zig-zags. Individuals of both sexes are often scarred: females, because they get gripped around the head and neck by males during mating, and males, because they bite one another vigorously when fighting. As you can seen from the photos, we found one female and two males. Note the scars on the female. Their size, shape and distribution matches what you’d expect had she been bitten by males. Note also the lost and partially regrown tail tip. 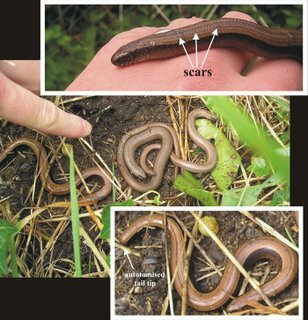 Slow-worms are like many other squamates in being able to drop the tail voluntarily by contracting muscles (this is known as caudal autotomy), but they do this more than is usual, with most individuals having autotomised their tails several times. This explains the specific name by the way. Why slow-worms exhibit prominent dimorphism I don’t know, but it’s been suggested that the dorsal stripe of the females might lend them some superficial similarity to the Adder Vipera berus, as this venomous species also has a zig-zag dark stripe along its dorsal midline. This is utterly unconvincing, however, given that the zig-zagging is indistinct, and that slow-worms and adders are otherwise so utterly different in shape and size. Furthermore, this theory is horribly anglocentric as it’s not as if the adder is the only venomous snake that inhabits the same range as the slow-worm (in Britain, adders are the only venomous native snake). In fact, other European snakes with zig-zagging dark dorsal stripes (e.g., the Viperine snake Natrix maura) are no more dangerous to potential predators than the slow-worm is, so mimicking them wouldn’t really be such a good thing. Oh yeah, among the most important predators of slow-worms are other squamates (most notably the Smooth snake Coronella austriaca), and they identify their slow-worm prey by olfaction, not by visual clues. Large, old male slow-worms are sometimes decorated with light blue spots, and at least a few females possess these spots too. The spots vary in intensity, distribution and number, and appear to occur randomly among populations. In Britain it used to be thought that blue-spotted animals represented a distinct subspecies that was dubbed Anguis fragilis colchica, but in fact there is no such taxonomic entity. To confuse things however, there is a supposed anguid taxon endemic to eastern Europe that was also named A. f. colchica (that was the original name – coined by Nordman in 1840 – but it should actually be A. f. colchicus), and it also is characterized, in part, by its blue spots (which are larger and more prominent than those of other slow-worms). While most authors continue to regard A. f. colchicus as a valid taxon, Šandera et al. (2004) found supposed A. f. colchicus individuals living sympatrically with A. f. fragilis individuals on Corfu, and they hence doubted the idea that A. f. colchicus really warrants taxonomic separation. Southern Greece is home to a distinct slow-worm population that is best known in the literature as A. f. peloponnesiacus, after the Peloponnese Islands where it’s found (it also occurs on the southern Ionian Islands). This name was coined in 1937 and it turns out that an older name, A. f. cephallonica, was created in 1894 for the same taxon. Distinguishable from other slow-worms by its high scale count at mid-body (Arnold et al. 1992), cephallonica is now deemed distinct enough from other slow-worms to warrant specific status (as Anguis cephallonica, and not A. cephallonicus* as often stated), so nowadays there are actually two slow-worm species. * Because Anguis is a feminine noun. On the subject of variation and taxonomy, I must say that the English slow-worms I’m familiar with often look quite different from the European and Asian individuals I’ve seen in photos. Interestingly, non-British slow-worms often look superficially more like glass lizards to me, being proportionally longer, more robust, and with larger, more sharply demarcated cephalic scales. I’m sure that this is an accident resulting from my familiarity with a local group of populations however, rather than anything important. Having said that, there is a paper titled something like ‘Unusual sizes of slow-worms and adders in Britain’ which sounds relevant to this, but I cannot find the full reference, let alone the paper, dammit. And on the subject of slow-worms and their close kin the glass lizards, I was going to discuss anguid phylogeny, the evolution of limblessness and the tricky issue of glass lizard paraphyly, but that’ll have to wait. Again, if you can’t wait until then, then by all means check out the literature I had in mind: Walls (1991), Macey et al. (1999), Sullivan et al. (1999), Wiens & Slingluff (2001) and Sanger & Gibson-Brown (2004). I’ve never known a slow-worm to bite - Knight (1965) wrote that a slow-worm ‘seldom bites at the human hand that grasps it’ (p. 23) - but one that I picked up once opened its mouth and let out a comparatively loud, throaty huff noise. I didn’t know they did this, so I asked around, and it seems no one else knows they do this either. I did hear of a case where a pet anguid (I forget of which species) let out a loud shriek, which if accurately reported would have been a genuine vocalisation rather than just a noisy exhalation. As you’ll know if you’ve checked the arcane literature on squamates, which snakes and lizards are really capable of true vocalisation is controversial, with anecdotal records suggesting that the ability to vocalize might be more widely distributed than generally thought. Officially it’s only geckos and some lacertids that vocalize, though pygopodids, anoles and teiids have been reported to make distress calls. This is an essentially random distribution within Squamata, so it’s certainly conceivable that groups like anguids might have evolved this ability too. If a slow-worm were to bite, I imagine it would be pretty painful. They prey mostly on small slugs and earthworms, but they also eat small snails, and to crush snail shells you need powerful jaws. Anguids in general have nasty bites: Sprackland (1991) reported that alligator lizards would be able to break human skin. An average slow-worm is less than 30 cm long. But how big do they get? Well, actually, I don’t want to answer this as I’m saving it for another post. It’s a story that involves a strange little island in the Bristol Channel and Stig Walsh’s back garden [UPDATE: now available on Tet Zoo ver 2, go here]. Coming next: pterosaur wing membranes. For the latest news on Tetrapod Zoology do go here. Arnold, E. N., Burton, J. A. & Ovenden, D. W. 1992. Reptiles and Amphibians of Britain and Europe. Collins (London). Knight, M. 1965. Reptiles in Britain. Brockhampton Press (Leicester). Macey, J. R., Schulte, J. A., Larson, A., Tuniyev, B. S., Orlov, N. & Papenfuss, T. J. 1999. Molecular phylogenetics, tRNA evolution and historical biogeography in anguid lizards and related taxonomic families. Molecular Phylogenetics and Evolution 12, 250-272. McCarthy, T. K. 1977. The slow-worm, Anguis fragilis L.; a reptile new to the Irish fauna. The Irish Naturalists’ Journal 19, 49. Šandera, M., Medikus, S. & Šanderová, H. 2004. Poznámky k herpetofauné Korfu a ostrava Paxos. Herpetologicke Informace 1/2004, 24-30. Sanger, T. J. & Gibson-Brown, J. 2004. The developmental bases of limb reduction and body elongation in squamates. Evolution 58, 2103-2106. Sprackland, R. G. 1991. Alligator lizards. Tropical Fish Hobbyist 39, 136-140. Sullivan, R. M., Keller, T. & Habersetzer, J. 1999. Middle Eocene (Geiseltalian) anguid lizards from Geiseltal and Messel, Germany. 1. Ophisauriscus quadrupes Kuhn 1940. Courier Forschungsinstitut Senckenberg 216, 97-129. Walls, J. G. 1991. The name game: alligator lizards and glass “snakes”. Tropical Fish Hobbyist 39, 142-145. Wiens, J. J. & Slingluff, J. L. 2001. How lizards turn into snakes: a phylogenetic analysis of body-form evolution in anguid lizards. Evolution 55, 2303-2318. Woods, M., McDonald, R. A. & Harris, S. 2003. Predation of wildlife by domestic cats Felis catus in Great Britain. Mammal Review 33, 174-188. Apologies for the late post but I thought I'd comment on the matter of slow worms biting. I was bitten by a slow worm about 20 years ago when I was at school. I'd taken one into school to show some friends and for reasons that I now can no longer remember I decided to place the animal in the front of my shirt for the afternoon classroom lessons. About a half hour into the class, the slow worm (quite rightly) decided to express it's feeelings on the matter and bit. As you guessed, it was painfull. It felt like someone had placed a large and very stiff bulldog clip on my belly. As I was in class and did not want to draw attention to myself and have to explain my circumstances, I sat there very quietly trying to focus on the lesson whilst fighting growing panic. As I recall it held on for a good five minutes before it released. I have no idea if this could be important for the biogeography of slow worms, but many years ago I have seen a comparably big slow worm with blue spots near Gößweinstein (South-West Germany), so this feature also occurs in central Europe. I have still a photo of it, but I think the blue spots are not good to see. I have never seen such a specimen again, but I knew that it was something special, because I read before in a herpetology book about blue spotted males. I had once a slow worm in a terrarium and it was always amazing to see it gulping huge earth worms which were nearly as long and not much lesser thick than themselves. Yes, slow worms definitely bite and yes, it is painful. I was bitten when gardening up on my allotment. I felt a very sharp pain but later my hand started really throbbing and felt very stiff. I then noticed two puncture marks and since I didn't know what had bit me I had to go to A&E in case it was an adder. The doctors looked at the marks and confirmed it was a reptile and that the only way that they would know whether the bite was harmful, ie from a poisonous reptile, would be if my arm swelled within the next few hours. So I had to sit and wait. But they felt a slow-worm was the likely cause especially as I knew that there were slowworms on my neighbour's patch. Apparently the bites can sometimes get infected. It hurt for a few days and I remember going to the library to look up some info as I had been brought up with the myth that slowworms don't bite and had thought them harmless. Interestingly the librarian confirmed that she too had been bitten by a slowworm and that it had been a very painful throb just like mine. The moral of course is never garden without gloves or put your hand into long grass! i am also going to leave a comment on the fact of slow worms biting , my little brother picked one up in the garden once ( he did never seem botherd by things like this) ...(until know).....and it bit him on the end of his finger ....my dad came to the rescue and prized it off .